There is a deep chord in all of us that seeks to discover and understand who we are through memories histories and emotions. My images are quiet, reflective and intimate, confronting the highly charged subjects of personal and cultural memory. I avail the full richness and variety of print media, constructing poignant, visual narratives that perform a twofold function. First, to bear witness to my subjects and their stories by memorializing them, and also simultaneously express the fact that our human impulse to know and remember our past can never be completely fulfilled. Determined to create a permanent impression with my audience and to portray caring and humanity balanced with pathos and grief, I incorporate images from photographs and other documents into my etched prints until a story evolves. For me these haunted yet sweet images of people and places now gone or maybe never known, renews their lives and gives substance to their memory. 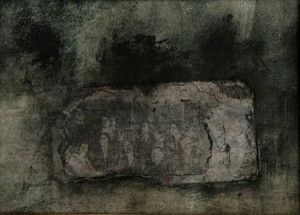 I try to capture the intensity and emotional hardships of a generation through printmaking techniques that range from engraving, etching, silkscreen, collagraph, monotype and combinations of two or more. The sometimes ragged cut lines from engraving on plexiglass and the uneven rough surfaces of collagraph plates, echo of broken pasts. Surrounded with hundreds of pieces of prints saved for recycling, as well as handmade paper, I assemble and layer dense overlays, as if putting together tattered remnants of a life. Just as memories of the past are often layered and allusive, so, too, are many of my prints. This interplay of present action with past imagery gives shape to visual narratives that are universally compelling.